The Community of Whale Cove is a small, traditional community located in the Kivalliq region of Canada’s newest territory, Nunavut. 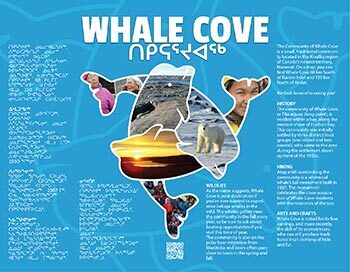 On a map, you can find Whale Cove 68 km South of Rankin Inlet and 150 km North of Arviat. Whale Cove is located on a rocky peninsula near the mouth of the Wilson River. This small community is still largely traditional, where hunting and fishing are a way of life to supply food and items of clothing.